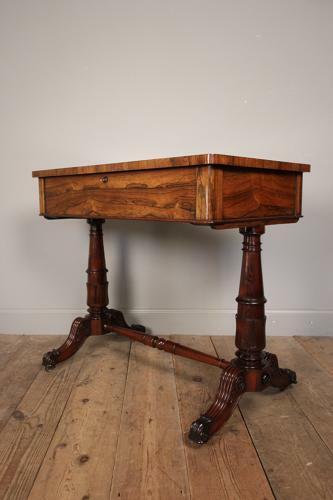 A rare example of a Rosewood George IV Bijouterie Table in the manner of Gillows. Having tapering lotus leaf carved columns with scrolled feet with the original inset brass castors. The top hinges to reveal the original plush velvet lined interior. Superb colour with original lock and key. English, Circa 1830. Dimensions: Height: 67.25 cm - 28 1/2 Inches, Width: 81.5 cm - 32 Inches, Depth: 48.25 - 19 Inches.